In the book of Genesis, God made a covenant with Abraham. As part of this covenant, God promised to give him the land of Canaan (Genesis 17:8). He promised that his posterity would be as numerous as the stars in the sky (Genesis 15:5), and He promised that all the families of the earth would be blessed through him (Genesis 12:3). God told Abraham, “I will give unto thee, and to thy seed after thee, the land wherein thou art a stranger, all the land of Canaan, for an everlasting possession; and I will be their God” (Genesis 17:8).3 Yet when Christ visited the Nephites, He showed that this covenant is actually conditional on the obedience of Abraham’s seed.4 After mentioning the Abrahamic covenant, He promised that when the house of Israel, “shall believe in me, that I am Jesus Christ, the Son of God, and shall pray unto the Father in my name ... Then will the Father gather them together again, and give unto them Jerusalem for the land of their inheritance” (3 Nephi 20:31, 33). The idea that the house of Israel needs to do what Abraham did to receive the blessings Abraham received helps to explain one element of the Abrahamic covenant. The Book of Mormon repeatedly quotes Genesis 28:14, in which God reaffirmed to Jacob the covenant he made with Abraham: “in thy seed shall all the families of the earth be blessed.”7 Immediately before this, the Lord promised Jacob, “and thy seed shall be as the dust of the earth, and thou shalt spread abroad to the west, and to the east, and to the north, and to the south” (Genesis 28:14). Because the Nephites had spread out all the way to the New World, far away from Jacob’s original home, this verse might have been especially meaningful to the Nephites. 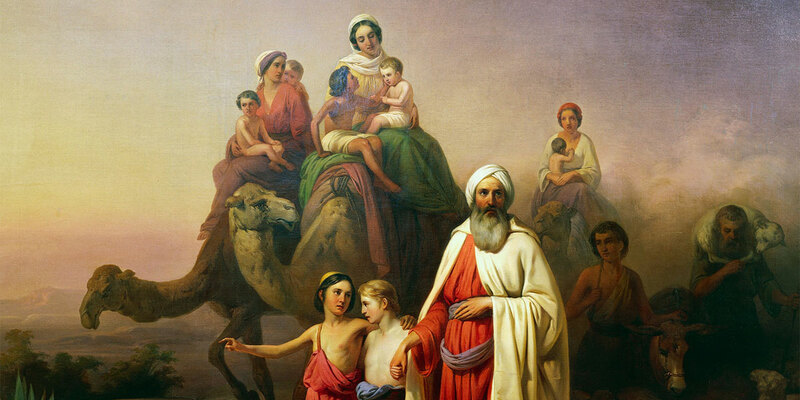 Yet, traveling far from their homeland is also another example of doing what Abraham did. A verse that is almost exactly the same as Genesis 28:14 appears in Genesis 12:3, “in thee shall all families of the earth be blessed.” This blessing was only promised to Abraham after he obeyed God’s command to “get thee out of thy country, and from thy kindred, and from thy father’s house, unto a land that I will shew thee” (Genesis 12:1). Leaving their country, their extended family, and their father’s house is exactly what Nephi and his family were commanded to do. Now all the peoples of the New World that the Nephites associated with were being blessed through them, Abraham’s seed.8 In this way, the Nephites were fulfilling the promises made to Abraham, blessing the families of the earth, by doing what Abraham had done. The Book of Mormon reminds us of how we can receive the blessings of the Abrahamic covenant. God will always bless us if we live up to our end of the covenant. Anyone, from anywhere in the world, no matter their ancestry, are blessed when they keep the covenants they have made with God. The Book of Mormon reminds us that if we wish to receive the blessings of the Abrahamic Covenant, we must live worthy of the blessings of that covenant. Some people might think that their covenants somehow give them a free pass; they have entered into a covenant and now automatically receive the blessings.9 The Book of Mormon reminds us that this is absolutely not the case. Abraham obeyed God and was blessed. We must obey God like he did if we wish to receive the unimaginable blessings God has in store for us. We do not have to be perfect. Abraham was not. But if we will believe in the Lord, pray to the Lord, and go where He wants us to go in life, we can receive all the blessings promised to Abraham and his posterity. Bruce J. Boehm, “Wanderers in the Promised Land: A Study of the Exodus Motif in the Book of Mormon and Holy Bible,” Journal of Book of Mormon Studies 3, no. 1 (1994): 187–203. Victor L. Ludlow, “Covenant Teachings in the Book of Mormon,” in The Fulness of the Gospel: Foundational Teachings from the Book of Mormon, ed. Camille Fronk, Brain M. Hauglid, Patty A. Smith, Thomas A. Wayment (Salt Lake City and Provo, UT: Deseret Book and Religious Studies Center, Brigham Young University, 2003), 225–245. Joseph Fielding McConkie, “The Doctrine of a Covenant People,” in 3 Nephi 9–30, This is My Gospel, Book of Mormon Symposium Series, Volume 8, ed. Monte S. Nyman and Charles D. Tate, Jr. (Provo, UT: Religious Studies Center, Brigham Young University, 1993), 357–377. 1. See Taylor Halverson, “Covenant Patterns in the Old Testament and the Book of Mormon,” presentation given at the 2017 BMAF–BMC Book of Mormon Conference, online at bookofmormoncentral.org. 2. For more on conditional and unconditional covenants in the Book of Mormon, see Book of Mormon Central, “How Can the Old Testament Covenants Help Us Understand the Book Of Mormon? (1 Nephi 2:12–13),” KnoWhy 363 (September 12, 2017); Noel B. Reynolds, “The Israelite Background of Moses Typology in the Book of Mormon,” BYU Studies 44, no. 2 (2005): 5–23; “Lehi as Moses,” Journal of Book of Mormon Studies 9, no. 2 (2000): 26–35. 3. For more information on this covenant, see Book of Mormon Central, “How Did Biblical and Ancient Near Eastern Authors Use Chiasmus? (Alma 34:9),” KnoWhy 340 (July 16, 2017). 4. For more ancient context for this, see S. Kent Brown, “The Exodus Pattern in the Book of Mormon,” in From Jerusalem to Zarahemla: Literary and Historical Studies of the Book of Mormon (Provo, UT: Religious Studies Center, Brigham Young University, 1998), 75–98. 5. See Victor L. Ludlow, “The Father’s Covenant People Sermon: 3 Nephi 20:10–23:5,” in Third Nephi: An Incomparable Scripture, ed. Andrew C. Skinner and Gaye Strathearn (Salt Lake City and Provo, UT: Deseret Book and Neal A. Maxwell Institute for Religious Scholarship, 2012), 147–174. 7. See, for example, 1 Nephi 15:18; 22:9–10; 3 Nephi 20:25, 27. These verses use the word kindreds instead of families, the same wording used in the King James translation of Acts 3:25. However, kindreds is a fine translation of the word rendered as families in Genesis and may simply show the tendency of the Book of Mormon translation to use New Testament versions of Old Testament phrases. 8. See D. Jeffrey Meldrum and Trent D. Stephens, “Who Are the Children of Lehi?” Journal of Book of Mormon Studies 12, no. 1 (2003): 44–46; reprinted in The Book of Mormon and DNA Research, ed. Daniel C. Peterson (Provo, UT: Neal A. Maxwell Institute for Religious Scholarship, 2008), 168–172; Book of Mormon Central, “What Does the Book of Mormon Teach about Families? (Mosiah 25:12),” KnoWhy 382 (November 16, 2017); Book of Mormon Central, “Why Did Lehi Divide His People into Seven Tribes? (Jacob 1:13),” KnoWhy 319 (May 29, 2017). 9. For more on how covenants really work, see Russell M. Nelson, “Children of the Covenant,” Ensign, May 1995, online at lds.org.